Karebou Design Studio is Karen Rubado's freelance web and graphic design company in Auckland. What makes Karebou different from many other companies out there is my personal attention and professional approach. I'm keen on providing my clients with not only a beautiful, functional, and effective website but also an excellent design experience. Contact me for a free quote or just to talk about your web project. 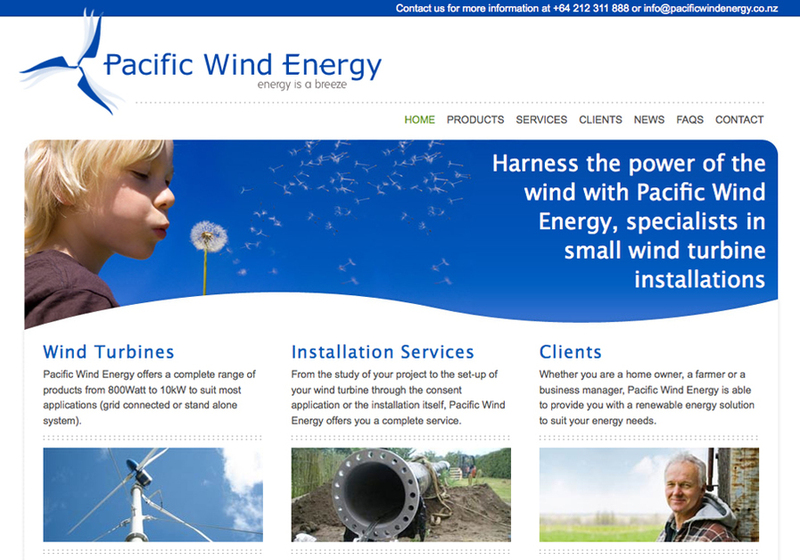 Pacific Wind Energy is a new company in New Zealand bringing small wind turbines to the market for rural areas. PWE needed branding and and a website to get their product information out to the market. I created a new logo for them based on an initial idea they had of using the shape of the NZ fern leaf as turbine blades. The site was designed to showcase their three main areas of interest, products, services, and their clients. Wordpress was used as a content management system allowing them to have complete control over their site content.